Fudan University students attend a talk by Jamie O’Brien, an accountancy professional specialist at the Mendoza College. The students visited Notre Dame as part of a program to expose international students to Western education and business practices. Photo by Matt Cashore. For the 22 undergraduate students from Fudan University in Shanghai, the July visit to the University of Notre Dame was a crash course in the American education system. Their two-week stay was arranged through Notre Dame Executive Education, which is located in the Mendoza College of Business. They arrived on campus July 13. 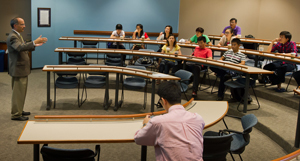 The students, who study primarily science and engineering at Fudan University, visited a variety of ongoing classes, from a business law course for Notre Dame MBA students, to ones in philosophy, sociology and physics. In a Master of Nonprofit Administration program — the business department serving those working in the nonprofit sector — the Fudan undergrads built houses from duct tape and newspaper along with the MNA clients in an exercise designed to promote creativity. Chinese high school students tour Better World Books in order to learn more about American entrepreneurship. They visited Notre Dame as part of the iLED program for Asian youth. A second aim of the visit was to provide exposure to American culture. In one session, several area high school students conducted a quick guide to American slang words, where they explained the meaning of such phrases as “chill out,” “pig out” and “yucky.” After an intense week of attending classes at Notre Dame, touring local companies and participating in cultural events, the group traveled to other destinations that could provide some insights into American life, such as Chicago, the Amish communities of Indiana, and Washington, D.C.
Chinese students from Fudan University attend a Mendoza College business law class led by Jaime O'Brien. Photo by Matt Cashore. Japanese Business Managers Program: Understanding American Business and Society. In the recently redesigned Notre Dame Executive Education program, which originated more than a decade ago, Japanese managers visited the Mendoza College to study American business practices through a focused survey of courses, including accounting, marketing, supply chain management and law. They toured a number of corporations in the area and in Chicago, as well as the Chicago Mercantile Exchange, and worked into the schedule a Cubs game and an RV Hall of Fame visit to give them some cultural insights. Universidad Francisco de Vitoria (UVF). Beginning summer 2013, ND Executive Education will partner with the university, located in Madrid, Spain, to provide a capstone experience for the graduates of UFV’s Excellens program. This is a five-year, bilingual program focused on global leadership. About 25 Excellens graduates will travel to the Notre Dame campus to participate in the Integral Leadership program, a signature Executive Education offering that emphasizes whole-person, values-based leadership. Advanced Specialized Certificate in Intercultural Management. The online course offered by Notre Dame Executive Education addresses the needs of American managers in negotiating the complex dynamics involved with increasingly diversified workforces. The eight-week course, led by teaching professor Elizabeth A. Tuleja, a noted expert in intercultural communication and global leadership, is designed to help managers make effective use of cultural diversity to improve operational performance, while reducing the potential for conflict. International Leadership, Enrichment and Development (iLED). The Mendoza College of Business also extends its international outreach through iLED, a Notre Dame program for Asian high school students. Offered in summer 2012, iLED offers a two-week curriculum that includes lectures and experiential learning opportunities from four colleges — business, science, engineering, and arts and letters, as well as the School of Architecture. With a theme focused on global challenges and global leadership, the curriculum includes lectures, hands-on learning, collaborative projects, business and community visits, and a trip to Chicago. The Gigot Center for Entrepreneurship at the Mendoza College arranged tours of area entrepreneurial ventures, such as Better World Books, and Innovation Park, in addition to conducting classes on business startups and social entrepreneurship. Originally published by Carol Elliott at newsinfo.nd.edu on July 20, 2012.